Cuddly toy and sweets? Would anyone want anything more as a romantic gift. 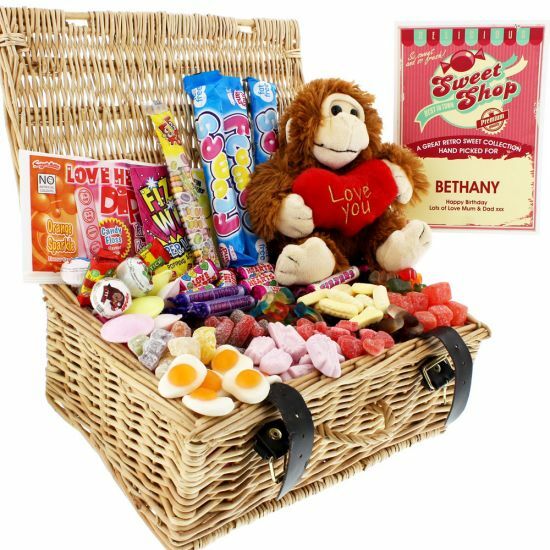 This personalised retro Sweet Hamper is hand made from wicker and measures 320 x 220 x 110. Not only is it crammed with 21 different retro and romantic sweets, it also houses an adorable little 'Love Monster' cuddly toy. Plus, the A5 label inside can be fully personalised with the recipient's first name, occasion and special message. After the sweet tooth has well and truly been satisfied, the hamper will then make a lovely storage box for more sweets or anything else you fancy. Makes the perfect romantic gift to celebrate a special occasion for him or her. Please note that contents may vary slightly.